As Rebecca correctly identified, the mystery seeds last week were from an Osage orange tree, Maclura pomifera. 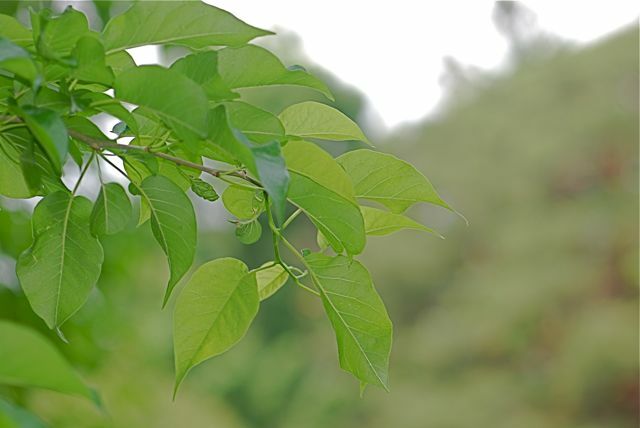 Osage orange has an interesting history. Let's take a look at the name first. The name Osage comes from the American Indian tribe. The Osage Indians apparently prized the wood of this particular tree because it makes superior bows. How about orange? Botanically, this tree is related to mulberries rather than citrus and it belongs to the family Moraceae. Although shaped roughly like an orange, the fruit is bitter, full of latex, and not edible. However, it does give off a faint odor reminiscent of citrus, which is probably the source of the name. 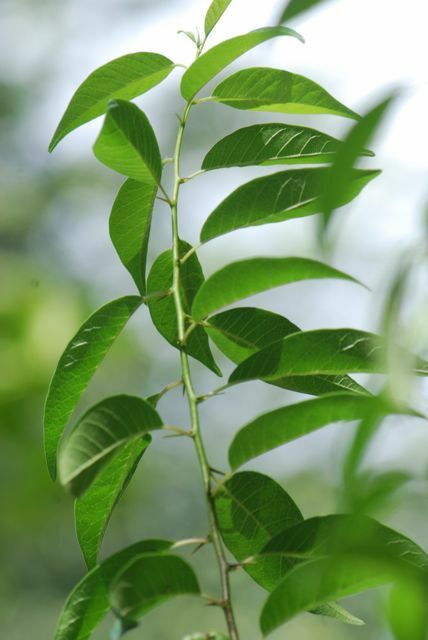 It is also called a number of other common names, such as horse apple. 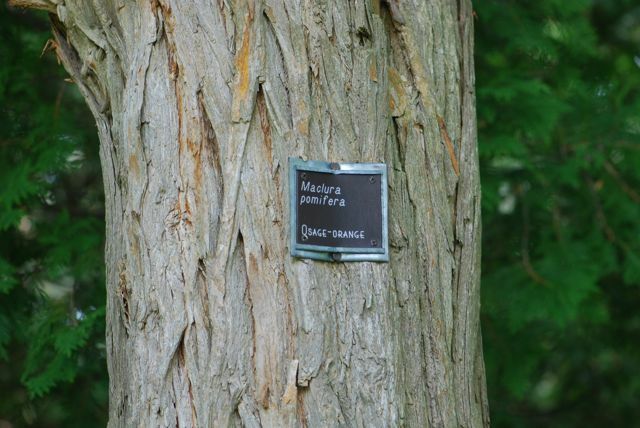 The trees have a rough, light-colored bark. Up close, you can see the exposed areas show an orange color. According to A Splintered History of Wood by Spike Carlson, Osage orange was originally found in the Red River Valley region of Oklahoma and Texas. In the late 1800's and early 1900's literally miles of the trees were planted as hedgerows throughout the Midwest. The young plants have thorns on the branches. A thick planting will create a natural barrier to livestock. Later, as barbed-wire fences replaced natural tree hedges, the trees were found to have strong, rot-resistant wood good for fence posts. The fruit are wrinkly green balls. When I was looking for more photographs of the fruit, I found this fun video by DNLee of Urban Science Adventures showing some Osage orange trees in a park in Missouri. Can you grow new trees from the fruit? Yes, you can. If you bury sections of fruit with intact seeds in moist soil, they will germinate. If you plant the entire fruit, you will end up with a tangled mass of seedlings. They will also grow back from the roots if you chop off the stem. 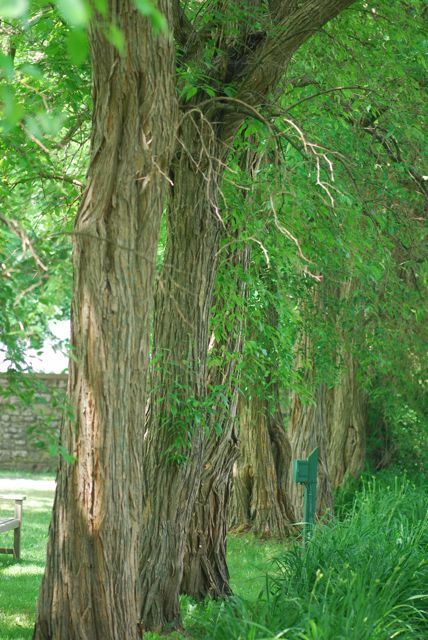 Have you ever seen Osage orange trees? Depending on the conditions, citrus takes at least five years and up to nine or ten years to produce fruit.